But this was no stump speech, and the hundreds of yarmulke-clad boys applauding him were not eligible American voters. Huckabee, an evangelical minister, saluted them in the name of King David, whom he called a warrior that yielded his heart to God.“I hope you see your service not as mere service to a country and a people, but as service to God Himself,” Huckabee said. This was the likely 2012 presidential candidate’s fourth public appearance of the day, and his 15th trip to Israel. Huckabee is one of many GOP presidential hopefuls showing their support by setting foot in Israel. Former Massachusetts Gov. Mitt Romney visited last month, and Mississippi Gov. 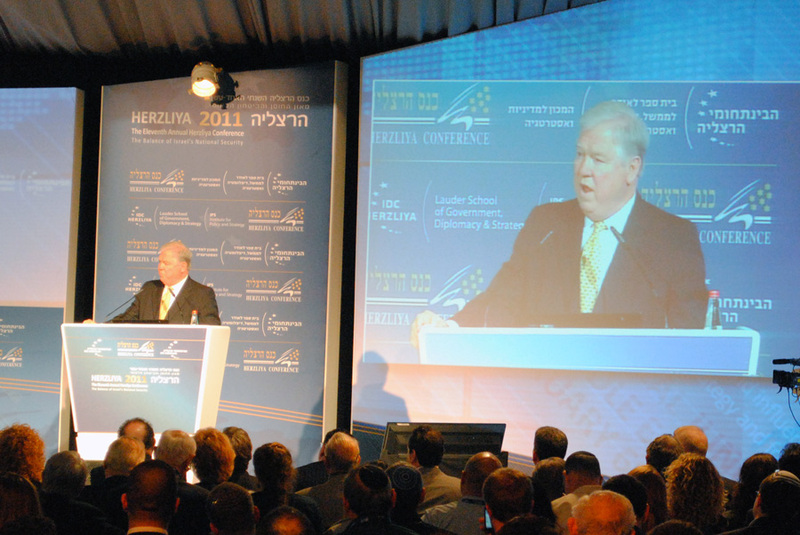 Haley Barbour wrapped up a trip this week, courtesy of the Republican Jewish Coalition. For Republicans considering taking the presidential plunge, a conspicuous jaunt to the Jewish state boosts foreign policy credentials and appeals to the conservative base in one fell swoop. All three met with Prime Minister Benjamin Netanyahu during their trips. Romney, however, kept a low profile on the Israel leg of his trip, which also took him to Afghanistan and Jordan. And Barbour made only one public appearance during his five days in Israel, speaking at the prestigious Herzliya Conference on Israeli security. Barbour addressed a session on the Iranian threat — the same topic Romney covered at the conference four years ago. It’s no secret that Israelis are deeply suspicious of President Obama or that many on the American right wish he would take a harder line on Islamic elements that threaten Israeli and American interests, especially as Egypt and other Israeli neighbors are steeped in unrest. Yet Barbour steered clear of criticizing Obama’s foreign policy and stuck to tried-and-true conservative themes: Iran threatens global security, Israel is our strongest ally, and American Christians stand behind you. Note to Barbour: The word “occupied” strikes a different chord in Israel. But while Barbour’s position seemed measured and politically benign, Huckabee’s position — and his tour itinerary — put him in direct conflict with U.S. foreign policy. 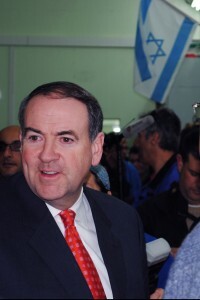 Huckabee is known throughout Israel for being one of the most outspoken American voices supporting Jewish settlement in east Jerusalem and the West Bank. Israel seized both areas in the 1967 Mideast war, and Palestinians claim both for a future independent state. The international community — including the U.S. — doesn’t recognize either region as a legitimate part of Israel. Those words might strike some as risky for a potential contender who has to appeal to more than just Bible Belt voters to have a serious shot at the presidency. Huckabee told The Hill that his lead in recent polls in moderate states such as Pennsylvania and New Jersey proves he enjoys broad support. “The narrative on me [in 2008], which I don’t think was exactly accurate, was that I was sort of the candidate of the evangelicals and the social conservatives,” he said. As Huckabee departed his swanky Jerusalem hotel for a day-long tour of some of the most controversial spots in the West Bank, his widely expected presidential run was the not-so-subtle elephant in the room. Danny Dayan, who chairs the settlers’ municipal government (and who also coordinated Huckabee’s West Bank tour), ambiguously wished the governor luck. Huckabee, who frequently salts his remarks with biblical references, was in his element as the bus made its way up Highway 60, the “Route of the Patriarchs” where Abraham and other Old Testament figures are said to have traveled. In the distance, barely visible through the bus’s foggy bulletproof windows, emerged Mount Hazor, where God is said to have spoken to Abraham in Genesis 13:17.“For all the land that you see, I give it to you and your offspring forever,” a tour guide from the settlements quoted as Huckabee nodded knowingly. Huckabee’s own comments have sometimes landed him in hot water. He says the Palestinian identity is a political construct, because Palestinians don’t have common religious, linguistic and cultural roots tracing back 3,500 years as do the Jews. He argues that if Palestinians want a state, they should turn to other Muslim nations. And when asked about the injustices Israel’s Arab minority alleges, he turns the tables, asking if Jews would be allowed to build a synagogue or run for office in Mecca or Riyadh in Saudi Arabia. But when challenged publicly, Huckabee has a way of disarming his foes with humor, humility and wit. At a visit to Ariel University Center, a reporter asked Huckabee about the boycott that some Israeli academics have launched against the West Bank campus. “People have boycotted me — I’ve always considered it a badge of honor,” Huckabee replied. As night fell on the territory that has continually plagued Israeli-Palestinian peace talks, Huckabee made his last appearance, at a winery where nearly 200 Americans had gathered for the start of a weeklong pilgrimage that Huckabee and his wife would be leading. Kathy Blevins, a Republican and born-again Christian from Silver Lakes, Calif., teared up as Huckabee welcomed the group. This was Huckabee’s base, and they were adoring. 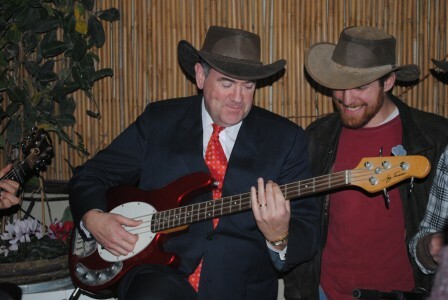 The man from Arkansas transitioned seamlessly from seasoned politician to entertainer — jamming with a band of Tennessee expats — and then again to tour guide, reminding the group of the next morning’s schedule: wake up at 6 a.m, breakfast at 7 a.m., on the bus at 8 a.m. sharp.